Sky Discovery will help arrange and power through your data faster with a complete suite of text analytics features, including categorisation, keyword expansion, concept searching, clustering, include similar documents and computer-assisted review. Analytics and predictive coding is revolutionary technology completely disrupting the legal review space. Identifying suitable keywords to identify relevant material can be a critical part of any case. Keyword expansion takes much of the guess work out of this process. By utilising text analytics, a more comprehensive set of keywords can be generated sooner in the review process by teasing relevant terms out of key documents. Start by searching on keywords of your choice based on your existing knowledge, and from those terms text analytics can provide a list of terms that are conceptually related based on the text content of your data set. Words that hold very similar meanings, such as “cold” and “frigid,” or words with multiple meanings, such as “leaves,” can skew results of traditional keyword searches and slow down the review process. 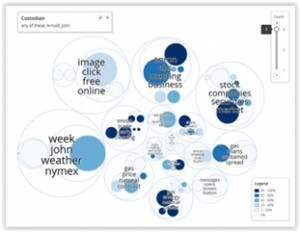 Concept searching is another text analytics feature that helps overcome obstacles in standard searching techniques. Concept searching goes beyond keywords to find documents based on ideas rather than specific terms. This allows you to identify important documents and follow an investigatory pattern, locating relevant documents even without knowledge of the specific terms, phrases, jargon, or code words that may be used in other documents. Categorisation allows unreviewed documents to be automatically grouped into categories, by learning for a small set which have been reviewed and coded by a subject matter expert. Categorisation can also be used to determine if uncoded documents are most likely to be responsive or non-responsive based on documents which have already been coded. As a valuable QA tool before producing a disclosure, this feature can assist locating privilege documents and prevent them from being inadvertently disclosed. Relativity can learn the concept of a privilege document by analysing the human identified privileged documents, and then reviewing the proposed disclosure. Any suspected privileged documents which have been identified can then be manually reviewed before disclosure. Clustering using text analytics helps get the most important groups of documents to review teams as soon as possible and will also batch documents by conceptual similarity for faster, more consistent coding. With this feature, you can organise and prioritise your review much earlier in a case. Clustering automatically identifies and groups documents with similar concepts. It labels those groups by the most prevalent ideas in each group and visually represents how the groups relate to one another. Unlike other text analytics feature, this is a fully automated process which requires no input from the user. Computer-assisted review helps you accelerate your review process by amplifying your team’s efforts across any substantial document set. Text analytics (categorisation) is one of the three key elements of computer-assisted review, which also includes statistical validation and, most importantly, actual humans. In computer-assisted review, senior reviewers code documents in the system in the form of seed sets, and the system applies their decisions to the rest of the document universe through an iterative workflow managed by the review team. The end result is generally a much faster and a less costly review experience.